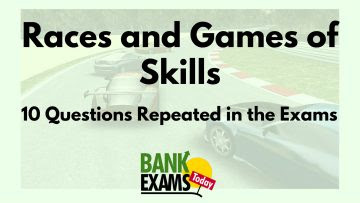 Races and Games of skills is an important chapter for banking examinations point of view. Here on BankExamsToday.com I am analyzing various exam question papers from past many years. Today I am listing down 10 questions that repeated in almost all the exams. In a kilome.tre race, A beats B by 30 metres or 6 seconds . Find the time taken by A to finish the race. Ans 1. It is abvious that B runs 30 metres in 6 seconds . In a 125 m Race , A runs at 10 km/hour. A gives B a start of 5 metres and still beats him by 5 seconds . Find the speed of B. In a kilometre race, if A gives B 30 m start, A wins by 20 seconds but if A gives B 30 seconds start, B wins by 20 m. Find the speed of B.
Ans 3. Let the speed of A be x m/s and speed of B y m/s. 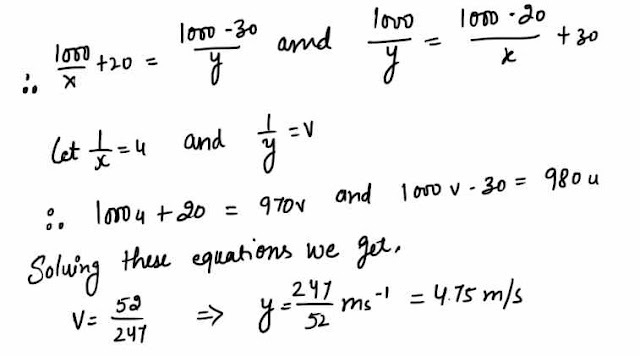 Hence speed of B = 4.75 m/s. A can run a kilometre race in 2 minutes and B in 2 minutes. by what distance can A beat B ? Ans 4. A beats B by 40 sec. A beats B by 20 metres . In a 100 m race , A beats B by 12 m and C by 15 m , In a race of 176 m, Find by how much distance would B beat C.
Ans 5. When A covers 100 m, B covers 88 m and C covers 85 m.
i.e. when B covers 88 m C covers 85 m.
B would beat C by 6 m in a race of 176 m.
In a race of 600 m, A can beat B by 50 m and in a race of 500 m, B can beat C by 40 m . by how many metres will A beat C in a race of 400 m? Ans 6. When A covers 600 m , B covers 550 m.
Ram and shyam run at 4 km on a course 250 m round . If their rates be 5 : 4 , how often does the winner pass the other? P can run one kilometre in half a minute less time than Q. 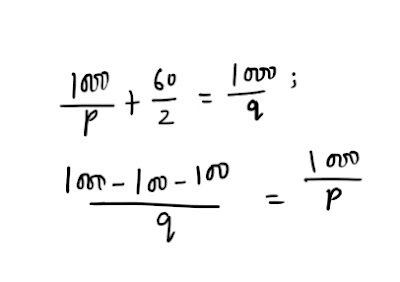 In a kilometre race , Q gets a start of 100 m and still losses by 100 m. Find the time P and Q take to run a kilometre . Hint : Let the speed of P and Q be P m/s and q m/s respectively .